We were really happy to discover this morning that The Pirate Bay is featuring Advance Patrol’s newest album on their homepage. This promotion will definitely help the band get some awesome exposure and thousands of new fans across the world (they are already among the top 100 downloads in the audio category with almost 1000 seeds!). The collaboration is also an effort to publicly discredit the prosecution against The Pirate Bay – where it seems like the Advance Patrol was unknowingly listed as a plaintiff – and show the world that file sharing can be legal & beneficial to the artists. It also just so happens that “El Futuro” is an awesome hip-hop album surely worth downloading! The hiphop group known as Advance Patrol will release its new album on The Pirate Bay today. They will do so to spread their music to as many as possible, and at the same time discredit the prosecution against The Pirate Bay, a prosecution where Advanced Patrol has been used as a scapegoat in the circus around the court proceedings. – We’re both proud and happy that we’re about to cooperate with Advanced Patrol concerning the distribution of their latest album, says Peter Sunde from The Pirate Bay. The name “El Futuro” origins from the Spanish word for “the future”, which feels like a direct hit, and suits us “like a glove”. 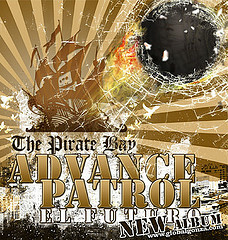 Advance Patrols latest album, El Futuro, will be released during the Sunday through the worlds largest service for file sharing, namely The Pirate Bay. The Pirate Bay has, as we speak, approximately twenty million simultaneous users, whom all with this is experiencing a digital release party with internet as its stage. prosecution of The Pirate Bay. With the release of their new album by Sunday, the group explains that they do not wish to be part of the prosecution against the large. – We never asked to be plaintiffs in this case, Gonza from Advance Patrol explains, they used us as scapegoats in a fight in which we don’t wish to participate. We refuse to be used in a war against our fans. – You cannot legislate away file sharing, Gonza says. Those who fileshares our music are also those who appreciate it the most. They are my friends, and friendship is something to be valued highly. That’s why we’re giving away El Futuro to the internet, to our friends. El Futuro can be downloaded for free from The Pirate Bay. If you wish to show Gonza your appreciation you can always donate what you feel is appropriate via Paypal. Its not a demand, naturally.